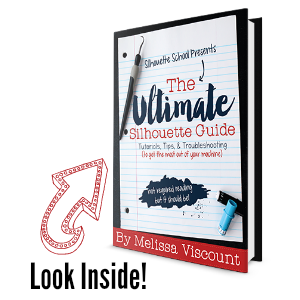 If you've purchased The Ultimate Silhouette Guide, I'd love to hear your feedback. Please leave a comment or testimonial below. Initially I was so overwhelmed as a new Silhouette user. This is my GO TO with all of my questions even now that I'm a little more used to the Cameo! The guide is well written, concise and easy to use for any novice! The Silhouette School EBook is my right hand helper! It resides on my desk at all times. Well written, very informative and concise. I have recommended this book to many, many friends and on several Facebook groups. My favorite page? Page 68! Thank you so much for writing it and I am very much looking forward to any and all update! I actually just finished writing an 15 page update. I will be emailing it out to all of those who purchased the ebook version in the next few days so watch your email. Libby, I have that page marked with a sticky note for easy access. I use The Ultimate Silhouette Guide almost every time I use my Silhouette. It is an easy to use manual, with excellent Table of Contents and Index which make it ever so handy. I printed my copy from my downloaded file and put it in a 3-ring binder, so it's easy to add updates and also lessons from the Silhouette School blog posts. I am so grateful for your instructions Melissa. A must for beginners and those who have had their machine for a while. I had so many "duh" moments when Melissa would spell things out in clear and easy-to-understand language. I get distracted easily and every time I read something new, I have to go try it. Thanks Melissa, for helping me get a handle on my Cameo, and inspiring creativity. The information in this manual is invaluable. Easy to navigate, easy to follow and understand. I know I would not enjoy and use my Sil without the manual readily available. If I want to try something new, or have forgotten steps what I need is right there! Thanks Melissa. This was such an outstanding purchase and well worth the price. I don't use my Silhouette on a daily basis and have this handy guide available to reference when I get "stuck", which at times is a lot! This is an absolutely must have book. It helps so much! I use it all the time. I printed it out and put in binder so I can just grab it when needed. I have used it a lot! Thanks so much for this amazing book!!! You shouldn't be able to buy a Silhouette without also purchasing this book. It is an absolute must-have. It is easy to follow and has made using my machine a pleasure instead of a nightmare. I was seriously considering selling my machine until I bought the book. This book is a must for the Silhouette owner! Easy to follow and makes life so much easier! If you own or thinking about getting a Silhouette - you HAVE to get this book! It is such a lifesaver! There is so much good information in this book, you will be amazed! I am so glad i invested in the e book thanks Melissa for a job well done. Best use of my money in learning all there is with the Silhouette Cameo! I have had the Silhouette Cameo for a few months and use this book everytime I am trying something new. As a Silhouette newbie, the book was very informative and easy to understand. This is the best resources of information about the Silhouette machine. It is my go to book when ever I try something new or am stuck figuring something out. Easy to read and understand. A must for any new Silhouette purchase. Melissa is so generous in teaching her knowledge of the Silhouette machines and her business. This book has been a lifesaver for me with my business several times. When I would have a problem and couldn't figure it out, I would go back and read Melissa's book and would find the answer that I was looking for. Thanks Melissa. Looking forward to reading the update. Melissa, your ebook has been a Godsend! I have owned my Silhoutte SD for years and have used it very little---they are old! Since your e-book came out, so many things I longed to try have now been unlocked---opened up for me. Thank you so very very much. Now I can't wait to receive my update! I LOVE this book and have recommended it to a lot of people. I don't have access to videos that everyone says to watch so I bought this book. It is my go to everytime! It has helped me so much! !Thank you Melissa for all the help you given me by writing this book! Anything you ever needed to know about the Silhouette is in this book! Great job! Love your help! Hands down the most useful book, full of great step-by-step tutorials. To have the resources at your finger tips to go back to time & time again is worth every penny of the cost of this e-book! I printed it out and I find it VERY helpful!! Absolutely the BEST Silhouette Guide... definitely deserving of its title as "Ultimate"! Melissa does a fabulous job of explaining, in detail, how to get the most out of your Silhouette. And updates at no extra charge... can you get that anywhere else? Thanks Melissa!! I purchased The Ultimate Silhouette Guide ebook as a person who knew absolutely nothing about my new Silhouette Cameo. I'm SO glad I did. Melissa's step-by-step directions with screen shots, helpful tips, and suggested pitfalls to avoid saved me so much time and frustration. Any updates to the book are free when you buy the ebook, which is nice. I printed mine up on super thick, glossy card stock to use as reference when I take my Cameo to a friend's house and don't have access to my computer. I would highly recommend buying this book. This book is excellent! It got me started with actually learning the abilities this machine has. I love my Cameo even more now! I love the Ebook! Easy to understand and to follow. It's great to be able to read the directions on the iPad as you are working on your computer. Thank you for the update. I would highly recommend this reference/instructional book. Wonderfully done! Easy to understand. This is "The Ultimate Silhouette Guide". I highly recommend it. Great job, Melissa! Thank you for writing this book! As I told you in Atlanta last November it's my second go to! The Bible is my first! Thanks for the free update as well, looking forward to Atlanta again this year!! This book is very helpful. Between it and the blog, I have learned everything I know about using my Cameo. This book was totally worth the money! I highly recommend it! Great book. Please don't think about buying it. just buy it. Thank you Melissa for all of your years of work getting us this fabulous MANUAL that is my go to book all the time. Should be included by Silhouette for anyone purchasing a machine!! Love your blog too and all of the help your provide!! You save us a ton of time fussing with our machines!! Thanks again for the 15 page update. Anxious to read it now that I downloaded it. Thank you Melissa! I had just purchased my Cameo several months before I came across your blog which provided a lot of helpful information. As a new user I was a little intimidated by the machine and when the book became available I immediately purchased it. Now I love my Cameo and with your expertise it gave me the courage and help I needed to try new things! Thank you, Melissa! I have used the e-book many times, and have recommended it to friends-who also purchased it! Love it! Thanks for all your effort you put into this book. I have used it many times when I have questions. I also love the silhouette blog for information. This book is the best for information on using the silhouette. A million and one thanks for your time and effort in creating the ebook. It has saved me from ruining vinyl on numerous occasions. Thank you Melissa! Your e-book is awesome! I'm mainly a scrapbooker but the instructions in your e-book have allowed me to venture into other projects with confidence. I like that I can easily skip around to the topics I'm interested in and don't need to read front to back before getting started. The free updates are a great customer service and makes me feel like I'm being kept in the loop by a super crafty friend. I actually read a lot of the book before I ever tried to do anything with my silhouette & use it for reference a lot. It was very helpful since it was all totally new to me. Since I'm (old school & like to have paper~lol)I hi-lited areas I thought I would need. Also, I joined a group on Facebook "Silhouette for Beginners" and after reading so many questions being asked from other people,I recommended they purchase this book. (I hope it didn't violate their rules & wasn't deleted before others saw it) The book is always my first go to before I go on to ask other people. Thank you so much! Love these books and her online videos. Thank you so much for figuring out all this for us. Is this book for the Curio as well, or more focused on the Cameo? I'm pretty much a beginner with the Silhouette but often get complex ideas that I want to cut. This guide takes me through step by step allowing me to turn my big ideas into cut files. The table of contents oes a great job of directing me to the section of the book for each technique. As others have said, an indispensable tool. I purchased this book back in 2015 soon after it came out. I have not been sorry. It has been my go to book. No one anywhere has produced such a simple language clear class style book. I feel like I have learned everything I know from Silhouette School and this book. I would have been lost without it. I think the book is wonderful and I am very grateful for its contents....but as a word of warning to folks from Australia purchasing the E-Book - I went for the electronic version because of its recommendations to being a smarter and cheaper option overall. Postage was of course an added expense to the purchase price - but when I took it to Officeworks (our version of Staples in Australia) to have it printed and bound, it was going to cost me close to $70 for the book and $45 for the Sticker book with the added cost of binding on top of that......almost double what it would have cost had I purchased the hard copies. I have all of the eBooks Mellissa has written and just purchased her eCourse last night. I find both the eBooks and eCourse extremely helpful in using my Silhouette Cameo. Also, Melissa suggest many good products to use with my Silhouette Cameo, making my crafting very enjoyable! Thank you, Melissa Viscount!